Fathi, Y., Poonthanomsook, C. (2007). A Quartic Quality Loss Function and Its Properties. 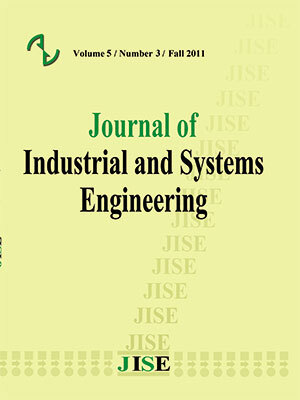 Journal of Industrial and Systems Engineering, 1(1), 8-22. Yahya Fathi; Chanwut Poonthanomsook. "A Quartic Quality Loss Function and Its Properties". Journal of Industrial and Systems Engineering, 1, 1, 2007, 8-22. Fathi, Y., Poonthanomsook, C. (2007). 'A Quartic Quality Loss Function and Its Properties', Journal of Industrial and Systems Engineering, 1(1), pp. 8-22. Fathi, Y., Poonthanomsook, C. A Quartic Quality Loss Function and Its Properties. Journal of Industrial and Systems Engineering, 2007; 1(1): 8-22. We propose a quartic function to represent a family of continuous quality loss functions. Depending on the choice of its parameters the shape of this function within the specification limits can be either symmetric or asymmetric, and it can be either similar to the ubiquitous quadratic loss function or somewhat closer to the conventional step function. We examine this family of loss functions in the context of their industrial applications and use them in a mathematical programming model for the parameter design problem. Bazaraa Mokhtar S., Shetty C.M. (1979), Nonlinear programming, theory and algorithm, Wiley. moments; Journal of Quality Technology 7; 1-12. Fathi Y. (1990), Producer-consumer tolerances; Journal of Quality Technology 22; 138-145.
with high-low tolerances; IIE Transactions 33; 1121-1127. Using Taguchi Methods in Technology and Product Development, Addison-Wesley. (with discussions); Technometrics 29; 253-285.
applications; IIE Transactions 34; 1101-1109. Phadke Madhav S. (1989), Quality engineering using robust design, Prentice Hall. of Quality Technology 30(2); 152-162. ––––– (1986), Introduction to Quality Engineering, Asian Productivity Organization. formulas; Technical Report No. 10, Princeton University, Princeton, NJ.